I'm glad I took time to read this. I get it now. I understand the popularity. If I had more time, I'd read them all. 1. The perfect anti-hero hero: a dyslexic hyperactive teenage boy. Dyslexic, "That's because your mind is hardwired for ancient Greek. And the ADHD -- you're impulsive, can't sit still in the classroom. That's your battlefield reflexes. In a real fight, they'd keep you alive. As for the attention problems, that's because you see too much, Percy, not too little. Your senses are better than a regular mortal's. Of course the teachers want you medicated. Most of them are monsters. They don't want you seeing them for what they are." 2. Plenty of humor. As Percy and his friends enter Hades, they see the Fields of Punishment, "which glowed and smoked in the distance, a vast, cracked wasteland with rivers of lava and minefields and miles of barbed wire separating the different torture areas. Even from far away, I could see people being chased by hellhounds, burned at the stake, forced to run naked through cactus patches or listen to opera music." 3. Loads of action. Fight scenes with his evil math teacher, Medusa, The Furies, and Ares, just to name a few. 1000 posts ago, this blog was created for a conversation between two people. It was about our reading journeys as we attempted to have read the Newbery. We didn't have a blogroll back then because we barely knew how to link. After about six months, we joined the larger Kidlitosphere conversation and our blogroll started to grow. When stories about how we use books in our classrooms started to seep into our blogging, we began to read and be read by teacher and librarian blogs. Our blogroll grew and the conversation about books and reading included a wider audience. We found that we could listen in on lots of Mock Newbery and Caldecott Conversations including those run by past Newbery Committee members. We've made so many new friends over the two years. We have started to get together with old and new blogger friends in Columbus to chat about books and to shop for new books! We really had no idea what we were doing when we started this blog (Franki, even less than Mary Lee). But after 1000 posts, we are still loving it and can't wait to see what we learn next! I am thankful for this five days off to "be still" and relocate the grace in my life. Wishing the same for you in some way, shape, or form. The round up this week is at Under the Covers. Mary Lee inspired me to share my NCTE convention week in words and pictures! As did everyone else, I had a great time and learned lots. The energy at the convention was amazing and I came home with my head spinning from all of the new learning. I mentioned earlier that I heard several sessions on 21st century literacies and am glad to have had the chance to hear Karl Fisch after having followed his blog for so long. I loved his message. Too often I got to "tech" workshops and the focus is on the technology or the product but the actual teaching goes against what I believe about kids and learning. But Karl Fisch is grounded in good teaching and understands learning. It was definitely a highlight. The convention opened with speaker Gary Knell, President and CEO of Sesame Workshop. What a great opening! So many great things going on at Sesame Street. As always, I was amazed with their mission not only in the US but around the world. I was also happy to hear that "THE ELECTRIC COMPANY" will be returning! Wooohooo! We saw some great clips and it was a great celebration of learning and literacy. And guess who joined Gary Knell at NCTE? One of my favorite muppets--GROVER! What a treat! You can see that my friend, Shari Frost, and I had our photo taken with him after the opening celebration. Check out the Sesame Street website and keep your eye out for The Electric Company that is sure to be a hit again! Another treat was the Books for Children Luncheon featuring children's author, Tomie dePaola! It was a great celebration with so many children's authors--one at every table. It was so fun to be in a room with so many children's authors and children's books! I was excited to be able to sit at Tomie dePaola's table and I received a copy of his new and gorgeous pop-up book, BRAVA, STREGA NONA: A HEARTWARMING POP-UP BOOK I LOVE this book. Growing up in a 100% Italian Family, this book is a true gift. Strega Nona gives us her secrets to a magical life and they include things like family and friends and food! The pop-up art is amazing and Tomie dePaola demonstrated how to open and close the book properly to see the gorgeous art! I had not heard dePaola speak for about 15+ years so it was such a treat. He talked a bit about some of the books he has coming out soon so we can look forward to those as well. But if you are looking for a great gift for a family member (especially an Italian one) this new pop-up book says so much! If you don't know Nancy Johnson, she was a key person on the Elementary Section Steering Committee who organized the luncheon and she is the perfect person to do this! (You should check out her book THE WONDER OF IT ALL: WHEN LITERATURE AND LITERACY INTERSECT.) Here she is with Ralph Fletcher getting last minute details figured out before the event. Ralph announced this year's NCTE Excellence in Poetry Award winner which will be announced on the NCTE website soon! Other highlights included Kathi Yancey's general session on Sunday, Barbara Ehrenreich's talk on her book NICKEL AND DIMED IN AMERICA, and Regie Routman's talk entitled, "Raising Expectation, Results and Enjoyment for All Learners: What Does It Take?" If you have the chance to hear any of these speakers, they were phenomenal! San Antonio was a lovely city for a conference. I was struck how different evening rush hour in the center of the city was this year, compared to last year in NYC. This is the Times Square of San Antonio. I had several memorable meals, but alas, neglected to take any food pictures. Use your imagination. At Rosario's I had a beautiful (and tasty) Prickly Pear margarita and (delicious) fish tacos (grilled talapia). The fish tacos were a risk, but I figured the best place to try them would be in Tex-Mex land. They were seasoned with lime and cilantro, so how could I go wrong? At the Random House author dinner at Little Rhein Steakhouse I had a fabulous steak. It looked just like the one in the ads on the convention center wall, if you were there. Yum. I sat at a table with Wendelin Van Draanen and got to hear about her new book CONFESSIONS OF A SERIAL KILLER, and her upcoming new series THE GECKO AND STICKY (watch for a review soon). Finally, at Liberty Bar I had SALMON ENCILANTRADO, grilled salmon marinated in cilantro sauce. It came with a side of cilantro pesto, which I am definitely going to try to make! Along with the obligatory Tex-Mex and the obligatory steak, there was the obligatory visit to the Alamo. Alas, we got there too late to go inside and take the tour, but we remembered (ha ha) to go. Probably my favorite session was the impromptu Tech On The Go session that I did in the Hilton Lobby (the only place I could find with free wireless access) for Katie and Karen. Both of them got set up with GoogleReader and we played around with podcasting and composing on GarageBand. Katie swooned when Debbie Miller stopped by to chat and look over our shoulders at GarageBand. Last week, NCTE adopted a Framework for 21st Century Curriculum and Assessment. Bill at Mr. Bass explains it will in his blog post today. As a teacher and as a librarian, I think it has lots of possibilities. It ties in the NCTE/IRA standards. I think it will give me a tool to really think about the kinds of things I am asking of my students and help me become smarter about my practice. See what you think. I think you'll see lots of posts this week reflecting on NCTE. I just visited a few bloggers who have already reflected on the weekend. 21st Century Literacies was definitely something I thought about all week. The theme of the conference was SHIFT HAPPENS and I worked hard to get to several sessions dealing by people such as Karl Fisch and Tim Tyson. I was amazed at what they had to share. I loved the message from both of them and it all fits with what I believe about classrooms and schools. Amazing presenters and I feel lucky to have heard them. I plan to keep up with some new blogs--blogs that focus on these 21st Century issues. I am pretty excited about it. And after talking with friends who are clearly more technologically savvy than I am, I decided that my technological world needs to expand a bit (actually, a lot!). I am going to try to add a few things to my life in the next few weeks. 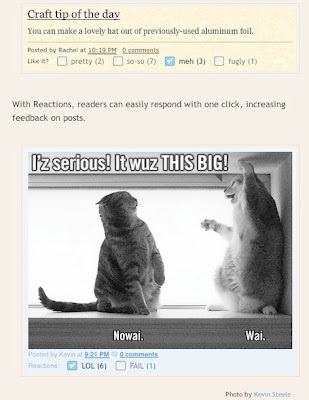 I just added blogs to Google Reader and am going to work to use the tool. I am also going to think about twitter (since Mary Lee is on the brink of twittering!) and I am also interested in learning more about Photovoice and a few other things. I am on a mission and hope to have fun playing around with all of the tools that I learned about in sessions and in informal conversations with friends! I was thrilled to see a new children's poetry book by Georgia Heard coming soon. (Yes, I got an advanced copy of it and am loving every page!) The book is called FALLING DOWN THE PAGE and it is an edited collection of list poems. This book is quite fun. The spine is on the top which works perfectly with the topic and clever title, don't you think? The book is filled with 45 poems by some of our favorite poets--Jan Yolen, Eileen Spinelli, J. Patrick Lewis, Kristine O'Connell George and many others. Each poem is a list poem, although there is so much variety in the presentation. As always, Georgia gives us a gret intro. She lets us know how important list-making is for her and for all of us. And then she shares her thoughts on the craft of creating list poems. She also lets us in on the fact that the poems in the book tell a sort of story--the sequence follows the cycle of a school year. She finishes by recognizing the fact that after reading this book, you will most likely want to write a list poem of your own! A great book for everyone. Kids of any age will love it. It will serve as a great mentor text or be a great book to add to any poetry collection. I love everything about it and CAN'T WAIT until it comes out in early 2009! 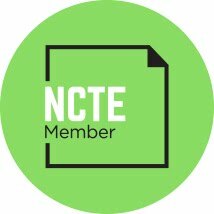 I, too, am at NCTE. Learning lots. Having plenty of fun. On the brink of Twittering. The theme of the conference is Because Shift Happens: Teaching in the 21st Century. I have found it quite ironic that the only place I can get reliable (free) wireless internet access is in the lobby of my hotel. Not so convenient. A definite disconnect. The round up was/is at Brimstone Soup. I am in San Antonio attending the annual NCTE Convention. It is a GREAT convention and I am learning lots. I don't have time to write about so many of the great things I want to share but I do have time for a quick book review! The exhibits are full of new books and some ARCS. 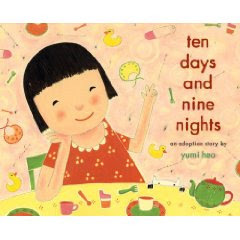 Today, I picked up a copy (ARC) of TEN DAYS AND NINE NIGHTS: AN ADOPTION STORY by Yumi Heo. I am always paying close attention to adoption books and this picture book is definitely one that we'll add to our collection. This book is not our adoption story, but is is a great adoption story. Told in very simple text and gorgeous illustrations, this book follows a little girl (for 10 nights and nine days) as she waits for her new sister to arrive. Her mother leaves to pick up the baby on an airplane while the father and daughter stay home to get ready. Each day means less waiting and new things to do as excitement builds. The predictable pattern and the illustrations work together in a way to show how much is happening for both the family waiting at home and the mother and the new baby coming home. At the end of the book, there is an author's note about her relationships with many families who had experienced adoption. This is a great book. I think it is a great addition to any collection of books about adoption. It would also be a great book to give to any young child waiting for a new sibling. I will definitely add this one to the school library when it comes out--it looks like it is due out in May. I plan to get a copy right as soon as I can! I didn't intend for this to be insect week at A Year of Reading. It just happened. Today's book finds Jimmy Grasshopper suing Nestor and Abigail Ant because, after a summer of providing them with entertainment, they refused to share the harvest with him. It's a question of respect, and it's a meditation on the value of art in society. "Am I not worthy of my bread? Does not the work of my heart and soul earn respect? I am an artist. Is there no place for beauty, no solace for the ear, no hope for the heart? Must everything be in the marketplace? Doesn't the marketplace itself need and deserve beautification?" This is not a version of Aesop's tale for the youngest readers and listeners. Instead, it might make a great gift for the artists and lawyers in your life. It's a beautiful little book with an important message, especially in these times when all eyes are on the marketplace. Reviewed by Jules at 7-Imp in June. I love Kevin Henkes. I love Chrysanthemum and Lilly and Wemberly. But I am also a HUGE fan of his children's novels. When I read THE BIRTHDAY ROOM several years ago, it quickly became a favorite and it ended up being one of the most powerful books I read aloud to my 5th grade class that year. So, I picked up BIRD LAKE MOON as soon as it came out last spring. But I bought it when things were busy and I had not time to read and somehow I forgot that I had it. Last week, one of our third grade teachers reminded me of the book. She came in telling me she had read the book and that she LOVED it! It was just the reminder I needed to get back to this book. I read it on the plane on my way to NCTE and was not disappointed. Henkes develops amazing characters. He does it with his picture book characters and he does it with the characters in this book. He is all about good characters who we know and love. In this story, two boys become friends and each is dealing with his own family issues. Henkes alternates back and forth between the characters and you come to like and understand both characters well. You come to understand the stresses they are dealing with and you understand the choices that they make--both good and bad. Both boys are doing a lot of growing up and learning to deal with pain. I have a hard time finding books with enough depth for younger (3rd/4th grade) children to talk about. I often find that either books are too shallow with not enough interesting issues OR they are too much for 8, 9 and 10 year olds. This book is perfect for upper elementary students. There are enough issues with the characters and things you find yourself thinking about, that it seems perfect for a read aloud or a book for a book club. I continue to be amazed by Henkes talent. The fact that he can write well for so many different ages is fascinating to me. I look forward to whatever it is he decides to write next! Yesterday we met a caterpillar with all kinds of personality; today we meet Dr. K. Fisher, a bird who answers all kinds of questions put to him by all kinds of creepy-crawlies. There's a scorpion who is counseled by Dr. K. Fisher not to go around wasting his venom on gratuitous stinging, an earthworm with body image problems, a bashful glowworm, and more. Interspersed between the question and answer letters are guides to creepy crawly bodies, insect wings, insect disguises, and insect colonies. Included are a glossary and an index. Wouldn't this make a great mentor text for a fun way to write a nonfiction piece -- as letters to and from an expert on the subject you've researched? Also in the Ask Dr. K. Fisher series -- dinosaurs, animals, reptiles, and coming in 2009 -- weather! There has never been a caterpillar with more personality than Houdini. His mother whispers to him when he is just an egg, "You will do amazing and magical things, Houdini." Sure enough, he winds up as the star of the show in an aquarium surrounded by a classroom full of children with all kinds of curious faces and quite a few missing teeth. He loses his audience to a turtle and a spider, so he has to think up a show-stopper of an act. Sure enough, he gets his audience back when he emerges as a butterfly. Reviewed here by Sarah, at The Reading Zone, who is the self-proclaimed "crazy butterfly lady." 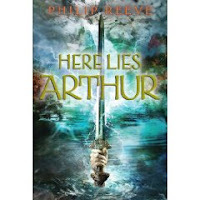 I'm always in the mood for a good retelling of the Arthurian legend, and Philip Reeve did not disappoint me. This story is set during the formation of Arthur's legend. Arthur is pretty much of a bully and plunderer; Merlin's magic is in the stories he spins to reinvent the truth. Sound like modern politics?Art does indeed imitate life and vice versa. The story is told from the point of view of an orphaned servant girl who is used by Merlin to pull off the Lady of the Lake stunt, then disguised by him as his servant boy until she is too old to pass as a boy. Merlin then reintroduces her as a cousin of his servant boy, and plants her as a lady in Guenevere's court so she can spy for him. The whole book is a meditation on the power of story to create an enduring "truth." And maybe that's not always a bad thing. Not always. The Telegraph reports that Here Lies Arthur won the 2007 Carnegie Medal. I have not been in the holiday spirit. Kind of annoyed that my favorite coffee shop started serving red paper cups already. Not ready to see all of the trees. It is only November, after all! But tonight, I finally had a chance to sit down and read Loren Long's new picture book DRUMMER BOY and I am totally in the holiday spirit now. WHAT A BOOK! If you are looking for a great, new Christmas story that will last generations, this one is just that. A great gift book for any child (or adult) you know. We all have our favorite holiday stories. My father read a certain version of THE NIGHT BEFORE CHRISTMAS to my brother and I each Christmas Eve when we were children. My oldest daughter loved to hear THE CHRISTMAS MIRACLE OF JONATHAN TOOMEY at Christmastime. There are so many holiday books published and I enjoy many of them. But very few do what this one does. I am sure that this new book by Loren Long will be added to many families' lists of holiday favorites. Definitely the makings of a classic. I am not going to say much about the story. I drafted something but it doesn't do the story justice. Loren Long says it in a way that I can't summarize. It is a perfect story about a toy drummer boy. Its message is great and the illustrations are stunning. This is definitely going to be a gift book from me this year. I am thinking it will be great for two preschoolers in the family. A book they can hopefully grow up with. I am pretty excited to give this book as a gift and to enjoy it in our family. Loren Long's website is definitely worth a visit. He shares original sketches of the art in the book as well as notes explaining his inspiration for the story. 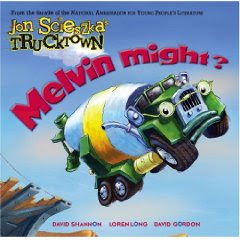 Loren Long visited our school last year when he and Jon Scieszka were touring for the new TRUCKTOWN series. He is a great author/illustrator visit. The kids loved watching him create his drawings! Snow. We haven't had any yet, have you? I'm not sure I want the reality of snow just yet -- driving in it, shoveling it. But if I think of snow as "the poem of the air," then I'm just about overcome with anticipation. Make your own snowflake at Make-a-Flake. 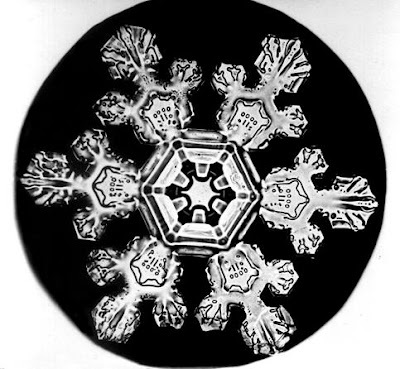 Check out all things snow at SnowCrystals.com. Snowflake Bentley's website is here. The image I used is one he made. According to the website, "Wilson Bentley did not copyright his photographs and thus they are in the public domain and free to use for any purpose." You just can't sell them, or make them into something to sell. Thank you, Mr. Bentley. The Poetry Friday round up is at Yat-Yee Chong. How fun is this -- we are one of the Children's Literature Blog Posts of the Day on the Children's Writing Web Journal of the Children's Book Insider! We got noticed! But really, it didn't take being in a YouTube video to clue us in that we've been noticed. We could tell by all the comments you've been leaving! Hasn't the 21 Day Comment Challenge been a blast? I started a day late, but I've had a few over-achieving days that have brought my average up to just over 5 comments per day. I have been using a combination of my GoogleReader, the links in our sidebar that aren't on my reader page, and random links I've picked up from your sidebars! The best thing about the Comment Challenge is that I can chat away without having to use up the last scraps of my voice. In '06 at about this time, the numbness in my feet was creeping up my legs and I wound up having emergency back surgery right after NCTE. I'd rather lose my voice than have the pain and numbness and fear I had that year. I started this "series" early in the school year and have since realized that a book has to be pretty darn good to make my list! Sometimes when I am reading a book I love to the 4th class in one day, I start not loving it anymore. It reminds me of when my kids were young and they wanted to hear the same book over and over and I got to the point that I couldn't stand the book anymore. But, there are a few books that I really do think I could read a million times. I just never tire of them. I have found two more books that make my list-books I can read over and over and continue to love them. WHO ATE ALL THE COOKIE DOUGH by Karen Beaumont is the most fun to read with young children. I love to watch their faces. They never tire of the rhyme and rhythm. And the ending is always fun--even when it isn't a surprise anymore. I first heard about this book from Katie at Creative Literacy. (I think she actually picked up a copy for me.) Who can tire of the rhyme that is almost more fun than the original? "Eeny, Meeny, Miney, Moe! Who ate the cookie dough". The text takes us through lots of possible suspects to find a fun surprise answer at the end. I love THE LITTLE BIT SCARY PEOPLE by Emily Jenkins for totally different reasons. My cousin told me about this book and I wasn't sold on it at first. But now that I have read it several times, it is definitely one of my favorites. This book takes a look at people who seem scary on the outside--the teenage boy down the street, the policeman whistling at traffic, the bus driver who blows her horn--and then helps us realize that maybe they aren't scary. I love the message of this book--looking past our first impressions of people, past the outside appearances. They're really not so scary after all! And the repeated texts and colorful illustrations add to an already amazing book. One I don't think I'll get sick of because I so love what it says. My students were THRILLED this week when they saw that I had a copy of the new Trucktown book by Jon Scieszka! They have loved SMASH! CRASH! and were thrilled to see another one with the characters that they met in the first book. MELVIN MIGHT? is about Melvin, a cement mixer. Melvin is a worrier. He worries about everything! When one of his truck friends needs help, Melvin is worried that he can't do it. This book has a theme that is similar to The Little Engine That Could and also reminded me of Wemberly Worried by Kevin Henkes. This is a great story with the same fun and colorful illustrations that we came to love in SMASH! CRASH! There are also repeated lines that the kids naturally jump in on. And, just like the first one, this book has a great fold-out spread! Lots to love about these books. Kids enjoy the stories and the illustrations. Scieszka clearly understands young readers. He gives them a story that works but also thinks about the text--giving them places where they naturally feel invited to join in. And he uses great language--words kids love--"roars", and "soars"--and fonts that show kids how text can be read. You know how I feel about leveled texts taking over our classrooms. Jon Scieszka's Trucktown books remind us that great authors can write great books for kids, without using controlled vocabulary and limiting text options. Instead, these books support new readers by engaging them in a great story and giving them language that invites them to participate, notice words that are used again and again. . Isn't this the best way to support our youngest readers? Carolyn Fisher got the memo that science should be fun. The Snow Show is a TV cooking show and the reader is in the audience for the episode where they make snow. As with any recipe, you start with your "ingredients: (available in your better latitudes) sun, water, wind, specks of dust, heat, cold." Next, the directions take you through the water cycle, the formation of snow crystals, and the assembly of a snowman, all with illustrations that explain and entertain. Along with the fun, the reader gets a giant helping of great vocabulary, like (new one to me) DEPOSITION -- when vapor turns to ice without turning into a liquid, and some scientific equations for phase changes, like the one for freezing: liquid - heat = solid (ice). A must-have for your weather unit. Especially this time of year! Here is Carolyn Fisher's website, where you can get a free activity kit to go with THE SNOW SHOW. 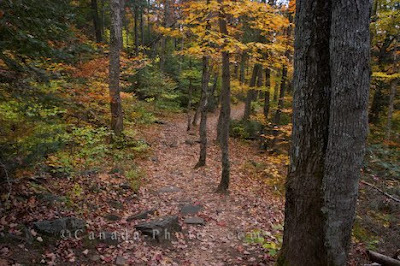 The activities range from easy to expert -- from seasonal to scientific. I bought it. Had to have it. If you are a fan of How Big Is It? and How Strong Is It? you are going to have to buy this book. Some animals don't do as they're told. Birds are supposed to fly. Fish are supposed to swim. Now meet the penguin and the flying fish. They've turned the rules topsy-turvy. You may be surprised to learn that some television cartoons show events that have nothing at all to do with reality! But before you throw down this book and start writing an indignant letter to the television networks, let's see how bad it really is. The fastest computer in the world is that small, squishy blog of glop inside your head. Even teenagers don't grow that fast. You might wonder if you can really use a sneeze to gain an advantage over your tennis opponent. You could, but please don't. It's not polite. And just to be safe, cover your mouth when you sneeze. Please. "And if you make me explain relativity theory one more time, I'm stopping this bus!" Who Invited Blogger to the Party? Check it out on Megan's blog -- let her know just how cute those nieces are!!! Did you see the news at MotherReader and Lee Wind? Are you going to try to comment on 5 Kidlitosphere blogs each day for the next 21 (or so) days? Give it a try. The bar is low. You can do it. Here's my theory (well, one I borrowed that I like a a lot): The world doesn't get changed by single monumental acts. The world gets changed by doing something small over and over again. It's like the power of reading aloud to your students for 20 minutes EVERY DAY. Sharing a poem with your students EVERY DAY. Making time to make a personal connection to each student EVERY DAY. I'll be looking for you in the comments! This is a story for today's children. The problems in the world around them (in this book the tension and violence between the Catholics and Protestants of Northern Ireland) can seem too big and too long-standing ever to be solved. And yet there's hope. A connection is made, child to child, across the boundaries that are meant to keep them apart and at odds. The adults may not be able to end "The Troubles," but perhaps the next generation will. Allison is a Catholic child in Belfast, Northern Ireland. To get to her new school, she has to walk through a Protestant section of town. Protestants line the road to harass and threaten the children and the adults who walk with them for protection. If that's not scary enough, Allison has a secret. She overheard her uncle planning to "teach a lesson" to a Catholic who has been seen associating with Protestants. The "lesson" involved being beaten senseless with both legs broken. What's a child to do when the adults around her perpetuate the violence rather than working to end it? The story turns around a button, a marble, and a connection made between Allison and a Protestant girl who has been forced by her mother to come participate in the harassment. This is an amazing contemporary story, based on an actual event, about the power of young people to bring about social change and justice. Like I said, it is a story for today's children. Eve Bunting has published over 250 books. She grew up in Ireland. She doesn't shy away from topics like homelessness, racism, divorce, and immigration (to name a few). This would make a great addition to an Eve Bunting author study in the upper grades and middle school. You must visit Michael Dooling's website. His catch phrase is History Through Picture Books, and when you browse through the list of books he's illustrated, you'll recognize many favorites. According to his bio, he often paints from life -- his family and neighborhood children dressed from the collection of vintage clothes and costumes that he and his wife have amassed. Eve Bunting's bio on KidsReads.com. Review and discussion at The Reading Zone. A great new poetry anthology by Bill Martin is out. 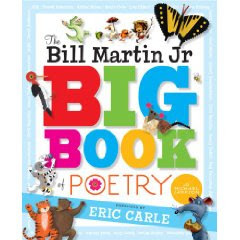 It is called THE BILL MARTIN JR. BIG BOOK OF POETRY. And it includes a forward by Eric Carle. It is a great anthology including almost 200 great poems for kids. 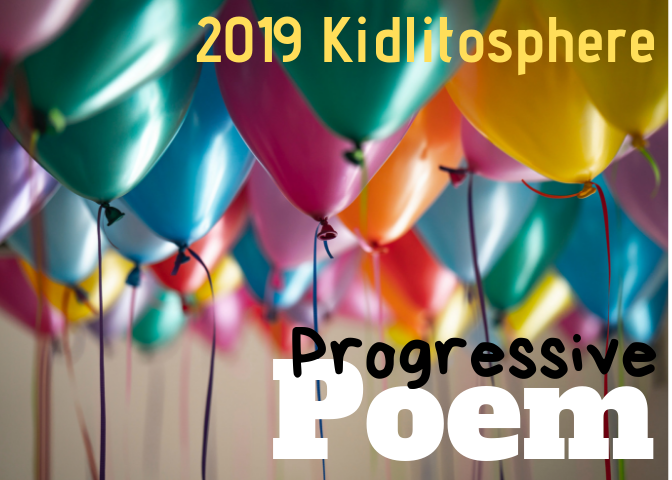 The poems are divided into categories such as Animals, World of Nature, People and Places, Around the Year, School Time, Mother Goose and more. You will see many of your favorite poets in the collection such as Aileen Fisher, Eve Merriam, Margaret Wise Brown, and Jack Prelutsky. The illustrations are done by some of your favorite children's illustrators including Lois Ehlert, Steven Kellogg, Chris Raschka and Ashley Bryan. This is more than a collection of poetry--it is a true celebration of some of the best poets and illustrators for children over the years. The round up this week is at Check It Out. Beth pointed this book--DR. FRANKENSTEIN'S HUMAN BODY BOOK: THE MONSTROUS TRUTH ABOUT HOW YOUR BODY WORKS--out to me the other day when I visited Cover to Cover. It is the coolest book! The premise is this--Dr. Frankenstein is in his lab and the lab is filled with body parts because....Dr. Frankenstein is planning on making a living, breathing human being in his lab. On each page, Dr. Frankenstein talks to readers. You can tell that he is talking to you because of the font--his words provide an intro for each page. Then the information begins. Each page focuses on one part of the body such and is named accordingly. Pages are titled such things as "Bone Basics", "Kidneys" and "Cerebrum". It seems that Dr. Frankenstein teaches us one thing each day because he keeps a little journal note on each page that includes extra info. This book is PACKED with information. After having spent a bit of time with it, it is one of the best body books I have seen. Lots of good information, a great layout, easy for kids to understand, and a fun premise. I think because of the storyline, some kids may decide to read this book from cover to cover which is an added plus. I am not usually a fan of nonfiction books embedded in a fiction story but this one works. Because Dr. Frankenstein is talking to us, the readers, it is an easier read than you would expect when you first look at the pages. And humor is spread throughout the text. This is a DK book that doesn't look like any of the others. And the size/shape/cover of the book are fun. Very unique and surprising. The book also includes a table of contents, a glossary and an index. And things are written in very developmentally appropriate ways. This will definitely be a popular book in the library! I just picked up another great new wordless picture book at Cover to Cover yesterday. It is called WELCOME TO THE ZOO by Alison Jay. This is one about a day at the zoo with bright, colorful pictures. There is lots going on in the illustrations and I couldn't quite get a handle on what was going on until I got to the end. At the end of the book, the author gives you a few things to do. She gives you one page of "can you find" pictures. Kids always like that. But my favorite is her list of "What else can you find?" On that page, the author gives you hints to all of the stories going on in the book. For example, "What happens to the hat? Can you follow it through the whole book?' She gives us several questions that invite us to go back through the book following that item. It was in that way that I discovered so many stories going on in the pictures that I hadn't noticed the first time. There is also a map so this book would be a fun one to use for mapping. This is a great book to add to your library--I think kids will have lots of fun with it. 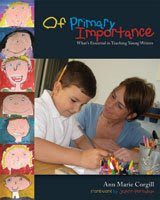 Ann Marie Corgill's new book OF PRIMARY IMPORTANCE: WHAT'S ESSENTIAL IN TEACHING YOUNG WRITERS is a MUST HAVE! No question! OF PRIMARY IMPORTANCE is a book about primary writing workshop and I really don't know of any other professional book that does what this book does. It really brings together all that there is to running a great writing workshop for primary kids--teaching well while staying true to what we know about how kids learn. Ann Marie has been teaching for fifteen years --at the Manhattan New School in NYC and now in Alabama. Although this is marketed for primary teachers, I think there are definitely things to learn if you teach older students too. First of all, the book is gorgeous. From the cover, to the inside color photos, to the photos throughout, you can see that Ann Marie creates beautiful spaces for her students to learn. You read about the space but you also have the opportunity to see the space. It is also clear that Corgill values student art and she makes that part of her students' work. (You see some of the student art on the front cover of her book.) As a writing teacher, I love the process of writing. But my struggle in the classroom was always in balancing the process with the product---finishing things up in ways that kept to my beliefs and also ended in products kids could be proud of. In this book, Ann Marie shows us how to value both. I would not say this is a how-to book. Ann Marie is all about the "whys" of her teaching. She understands the theory behind all that she does and her book helps us think through our own writing workshops. She also spends a lot of time talking about the issues she has with mandated curriculum and the importance of workshop. But she also gives us some nuts and bolts. She shows us her yearlong plan and then goes into depth with each unit of study---sharing book titles and planning that goes into each unit. At times, she even tells us exactly how she had kids create the art that went along with a piece of writing. Reading the book will make you want to be just like Ann Marie, but, it is clear that she doesn't expect us to just do what she does. She is sharing her story so that teachers can become better teachers of writing. I can see this book working for teachers no matter where they are in the teaching of writing. For me, it helped me think through issues with my own teaching--reflecting as you do when you hear an expert teacher share their story. I also got some ideas and found lots of things I wanted to try. For teachers who are looking for units of study, Ann Marie shows us the nuts and bolts to many of her units--including children's books she uses in her teaching. Teachers can easily pick a unit to try "Ann Marie Style". Or you can follow Ann Marie's yearlong plan. For teachers new to the writing workshop, this book is a great intro into the best of what writing workshops can be. Assessment is a huge part of Ann Marie's work and she shares her assessments and record-keeping. So many books ignore this piece. Again, Ann Marie is able to show us how she balances process and product when she assesses. Ann Marie has several routines in place and shares several folders that help her keep track of student growth. She also shares ways to involve students in the assessment process. Her family celebrations sound like a great time for students and parents and she spends time telling us about those events. From classroom space to routines to tools to strategies--Ann Marie covers it all. This is a book written BY a classroom teacher--one of the best writing teachers I know--FOR classroom teachers. It is thoughtful and practical, grounded and political, all at the same time. I really can't think of another book for elementary writing teachers that does as much as this book does. It will definitely impact writing classrooms everywhere.